When first looking at the blueprint for the CCNA/CCNP/CCIE Data Center track, one of my biggest fears was storage. My entire career thus far has been based on traditional IP data networks, not storage networks. I’m used to things like MAC addresses and IP addresses, not WWPNs and FCIDs. This is a completely foreign technology to most Network Engineers. You have to think back, at some point we were young and hopeful CCNAs-to-be, we knew nothing, but that didn’t stop us! Intimidation is over-rated, so throw fear aside and know that persistence always wins. As always, I highly recommend reading through the entire Cisco.com config guides, utilize your free account on CiscoLive365, and if you can afford it, get yourself an account with a trusted training provider like INE or IPexpert. The topology we’ll be following is detailed below. I’m going to walk through with just a single VSAN, but you very well could run multiple. I’ll be doing future posts running two VSANs, its just less redundant configuration to worry about when learning fundamental FC topics. All links will be shutdown and we’ll start with a default configuration. Fibre Channel switches have Domain IDs that are used to identify them in the fabric. They are automatically assigned by the principal switch, which is automatically elected (no configuration necessary). You can statically assign Domain IDs if desired. When a device connects to the fabric switch, it will perform a fabric login (FLOGI). This tells the fabric about your World Wide Node Name (WWNN) and World Wide Port Names (WWPN). Think of WWNs like MAC addresses in the ethernet world. They are burned-in physical addresses. WWPNs are used in zoning. The fabric will then assign a logical Fibre Channel ID (FCID) to each WWPN, which will be used for switching in the data plane. Think of these like IP addresses. 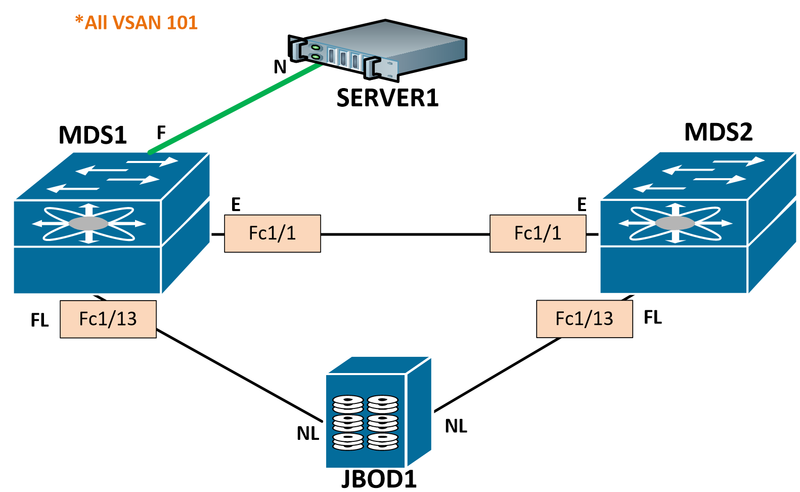 Fibre Channel Name Server (FCNS) is used to create the WWPN-to-FCID table. Think of this like the ARP cache or DNS. VSANs are virtual SANs, almost like VLANs in how they separate domains. Each VSAN will have its own FLOGI, FCNS, principal switch, zoning, aliases, etc. We will first want to create our desired VSAN, then add our desired interfaces to that VSAN. Often times MDS ports will auto-negotiate their Port types (F, FL, etc). In this case, we can see the operational mode was negotiated to FL. This is a Fabric Loop port since we are connecting to a JBOD. Upon enabling these interfaces, the JBOD’s 8 disks sent a Fabric Login (FLOGI) to the switch. The FLOGI database is local to the switch. Each disk will have 1 WWNN and 2 WWPNs (1 for each port). Since we only have one port up right now, we will only see one WWPN for each disk. Notice FCIDs were already assigned. The FCID is comprised of the switch’s Domain ID, Area ID and Port ID. We can also check out the FCNS database. The FCNS database is global to the fabric. Since there are no other switches in the fabric yet, we see the same output as the FLOGI database. Cool thing is you can see the port types, notice the NL (Node Loop). Notice VSAN 4094 – this is an isolated VSAN, used as a landing VSAN for interfaces that have been removed from configured VSANs. Typically this is on VSAN 1, but I was playing with the MDS earlier. No worries if you see this. If you scroll up, you’ll notice that each disk has the same “NODE NAME” on each switch but has a different “PORT NAME” on each switch to identify itself on that particular fabric. Next, let’s bring up an expansion port between the switches. This is a trunk, and like ethernet, we can allow only certain VSANs. Perfect. Notice we’re seeing the FCIDs from switch Domain ID 0x01 and 0x0f. We can also see that a principal switch (MDS2) was automatically elected in the fabric for VSAN 101. This switch is responsible for providing FCNS. This is where your PLOGI is sent after the initial FLOGI. Cool, so now that we have a trunk up, we can see disks from both switches, so lets enable a server port and setup zoning. Zoning is used to tell group WWPNs together for permitted communication. You may want to restrict which servers can see which disk, and zoning is how you accomplish that. Zones consist of members, zonesets consist of zones. Zonesets get activated to become enabled. The “Full” zoneset is what is in the running configuration on the switch. The “Active” zoneset is what is actually active fabric-wide. Let’s bring up a server interface (only going to use 1, realistically you would bring up both), and create a zoneset with a single zone allowing the server WWPN to communicate with JBOD1 Disk 1 on the A side. The command above shows the active zoneset, the one below shows the full zoneset. There is a complete distinction between the active zoneset (what is actually enabled) and the full zoneset (which is in the configuration). Take a look on MDS2, we have an active zoneset (pushed from MDS1), but we have no full zoneset. Where did our original zoneset SERVER1-JBOD1-A-D1 go that we learned from MDS1? So how do we get these to share zone information without overwriting each other? We need to enable zoneset distribution. Let’s clear the zone, which removes all zone configuration for the VSAN. This does not affect the active zoneset. Success!! We are now sharing zoneset information. Instead of manually typing in WWPNs every time we want to configure a zone, we can use fcaliases. These are locally significant, but can be distributed with zoneset distribution enabled. When we activate a zoneset, it will distribute the fcaliases. Quite a bit easier to read, eh? – Local fcalias names do not get synced between switches unless zoneset distribution is enabled and the zoneset activated. – More importantly, multiple people can make changes simultaneously and cause significant damage with zoning inconsistencies. Total number of flogi = 10. We can use these in zoning, of course, configured the same as fcaliases. For troubleshooting or schema purposes, you may want to statically assign these addresses. This is best done before a deployment, as a change in this ID can be disruptive, as you will see below. Let make sure that the preferred domain ID for VSAN 101 on MDS1 is 1, and the preferred domain ID for VSAN 101 on MDS2 is 2. Since this is a lab environment, I can force an update. This is disruptive, do not try at work. Now we are running our using our preferred Domain ID for VSAN 101 in the fabric! 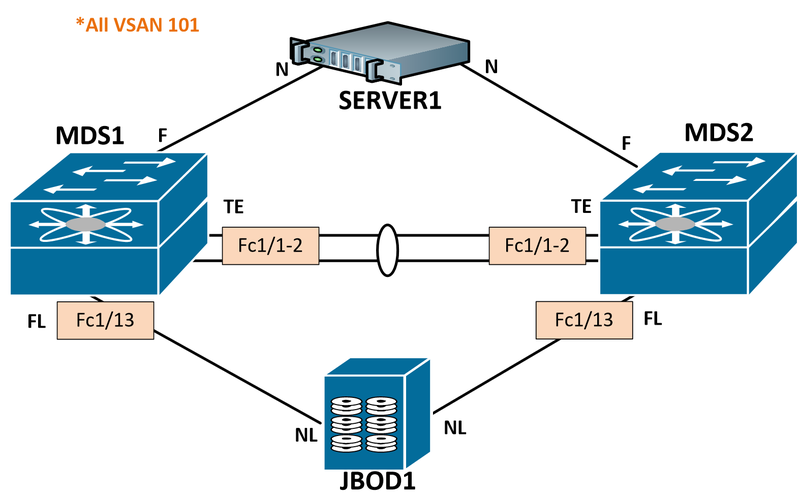 Fibre Channel networks run Fabric Shortest Path First (FSPF) to route traffic between switches. It runs automatically as a Fabric Service, with no configuration necessary (unless you want to tweak routing). It uses the same Dijkstra algorithm as OSPF. Link speed and number of hops are used to calculate the shortest path tree. ECMP is supported. You can view the full routing table by running fcroute commands (it’s own routing table like mroute). Notice below that you can see the protocol (local or fspf), the VSAN, and FCID with it’s masking information, as well as next-hops and cost. As you can see, we have 2 ECMP next hops to get to Domain ID 2, which is MDS2. 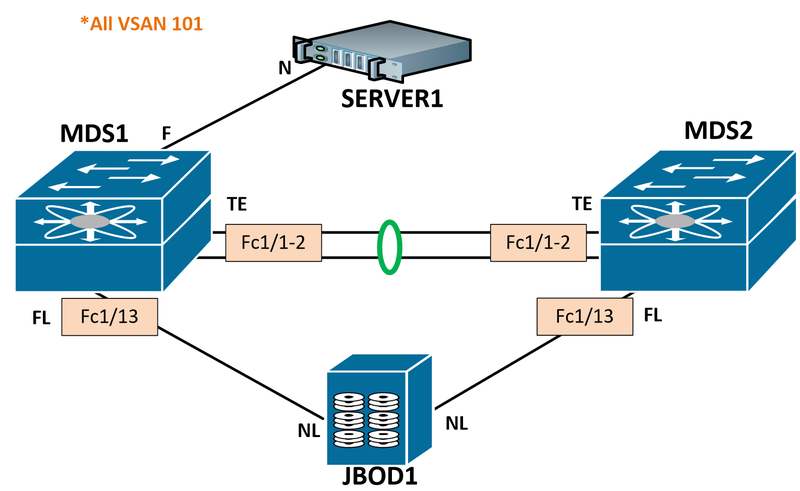 Important thing to note here, FSPF uses FC Exchanges to represent “flows” like you would see in the Ethernet world. The max FC frame size is 2112 bytes (SCSI payload + FCID). If you wanted to send 100,000 bytes of data, you would need to break these up into individual frames (or sequences). An Exchange is a bidirectional grouping of these sequences, and FSPF ensures that all sequences in an Exchange will take the same synchronous routing path. The exchange ID is the “OX” identifier sandwiched between the SCSI payload and FCID in an FC frame. You will often see OX-ID as a configurable parameter for load-balance hashing. Much like any other routing protocol, we can influence path selection by manipulating cost. If we wanted to ensure that communications between MDS1 and MDS2 use interface fc1/1, we could lower the cost on this link. We can create port-channels, same as the Ethernet world, and bundle physical links to aggregate bandwidth. SAN port-channels run Port Channeling Protocol (PCP) instead of LACP/PAGP for link negotiation. On the MDS, these are configured as port-channels, on Nexus devices these are configured as san-port-channels. Nice, we are up, trunking and our operational speed is 4Gbps. Thank you so much for taking the time to create this document. 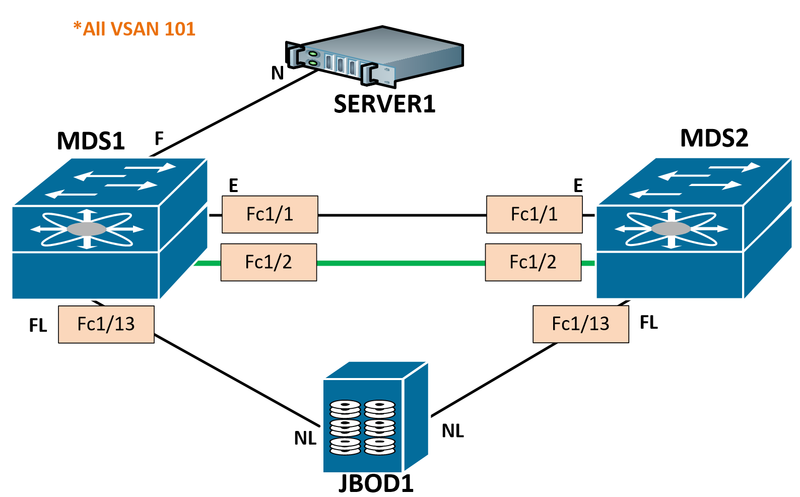 This has helped me tremendously in creating my first fc zone on Cisco MDS. It happens if it falls one of the physical ports Po ?. the cost becomes 500 or 250?. Great Work!! Thanks for creating such a nice and helpful document on zoning. Haven’t touched MDS in a long time, but this doc was so easy to follow and covered all the basics I needed. Thanks! Literally the best zoning guide I ever seen! Really good job! Thank you! A masterclass in clarity – thankyou.